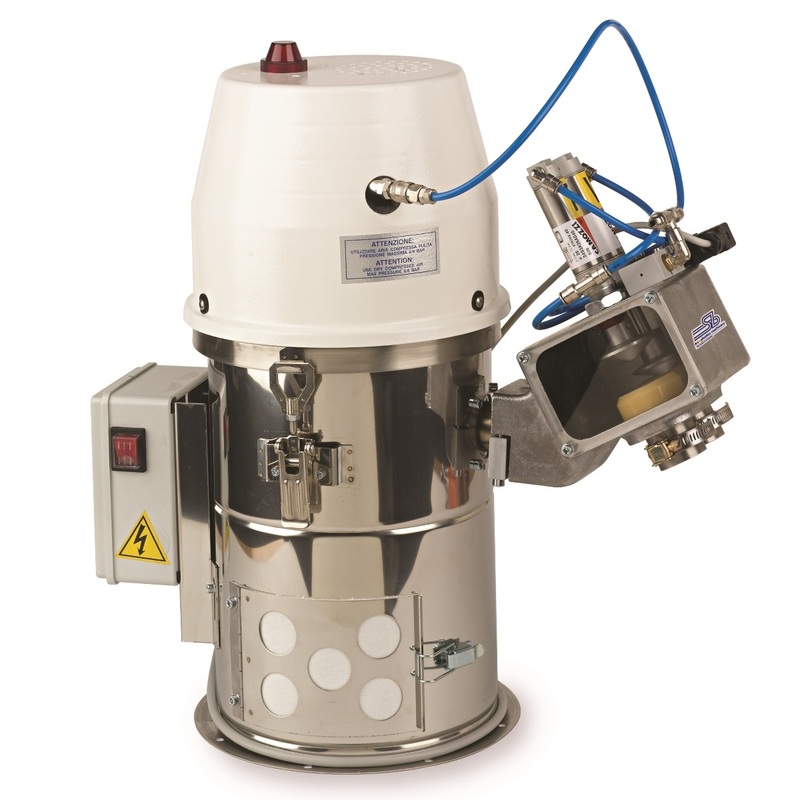 The single-phase FSB hopper loaders for the transport of plastic granules are a reliable and competitive solution to easily automate important areas of the production process. Equipped with an integrated suction unit and a sensor charge control, they guarantee the material requirement up to 200 Kg/h at a distance that can reach 20m. 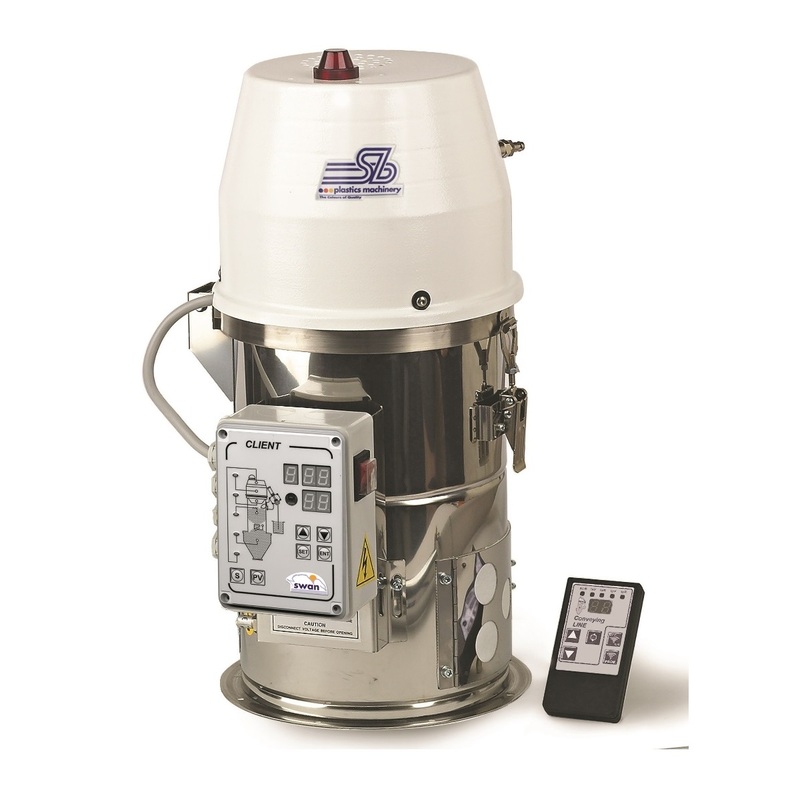 The single-phase FSB hopper loaders are the winning choice for single applications on dehumidification hoppers, dosers and transforming machines. A curiosity: “single-phase” refers to the 230V voltage of the motor mounted directly on the cover of the loader. Although the term is improper, traditionally the linguistic use has been imposed to identify with a “single-phase” power supply a vacuum suction unit with an integrated motor. The construction is in stainless steel AISI 304 for all the parts in contact with the raw material. The soundproof protection of the motor guarantees a noise contained in a threshold of 76db. The 0.95 kW two-stage blower is controlled by a so-called “soft-start” function that reduces brush wear, lowers energy consumption and preserves engine life. All units are fitted as standard with a high-density and resistant fabric filter with protective basket. The filter cleaning is automatic and takes place through a decisive and controlled release of compressed air collected in a pre-accumulation tank. The RS 485 serial output (modbus protocol) is standard and can be used to connect the unit to a proprietary or third-party supervision (4.0). The exhaust valve is equipped with a gasket that ensures maximum air-tightness during the material intake phase and therefore maximum productivity. The closure of the lid is made hermetic by an independent seal and removable during maintenance. The control is equipped with setting and display of suction times. Failure to charge is signaled by an alarm. The wear of the motor brushes is previously reported to avoid unwanted faults. The proportional valve control is integrated and allows the management of the cycles to reduce the stratifications during the material charge phase. 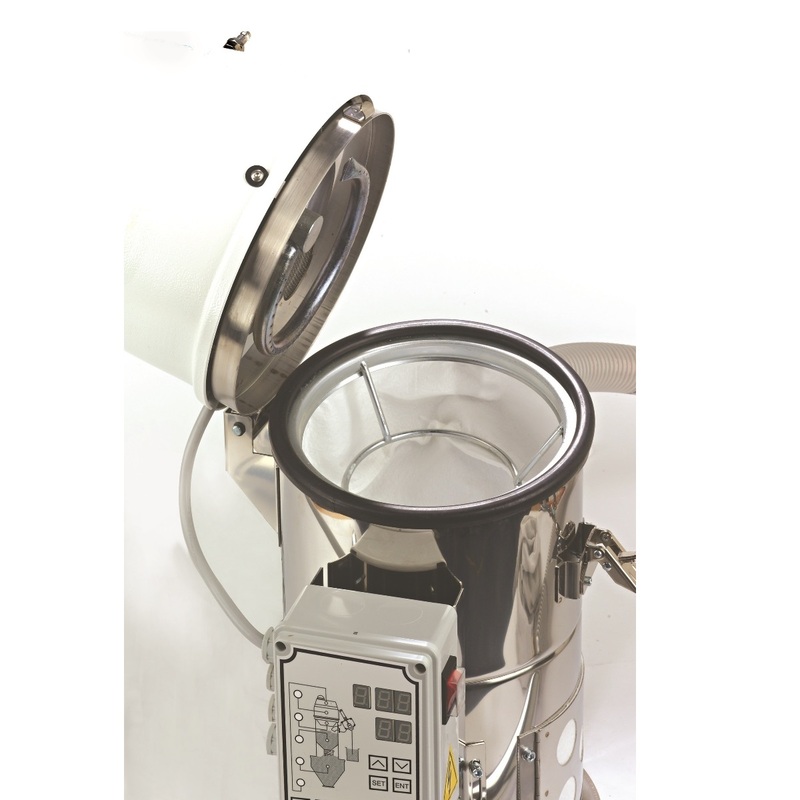 The proportional valve for the time-based dosing of two materials (for example a virgin and a regrind) is supplied separately and can be installed at any time without any additional cost. 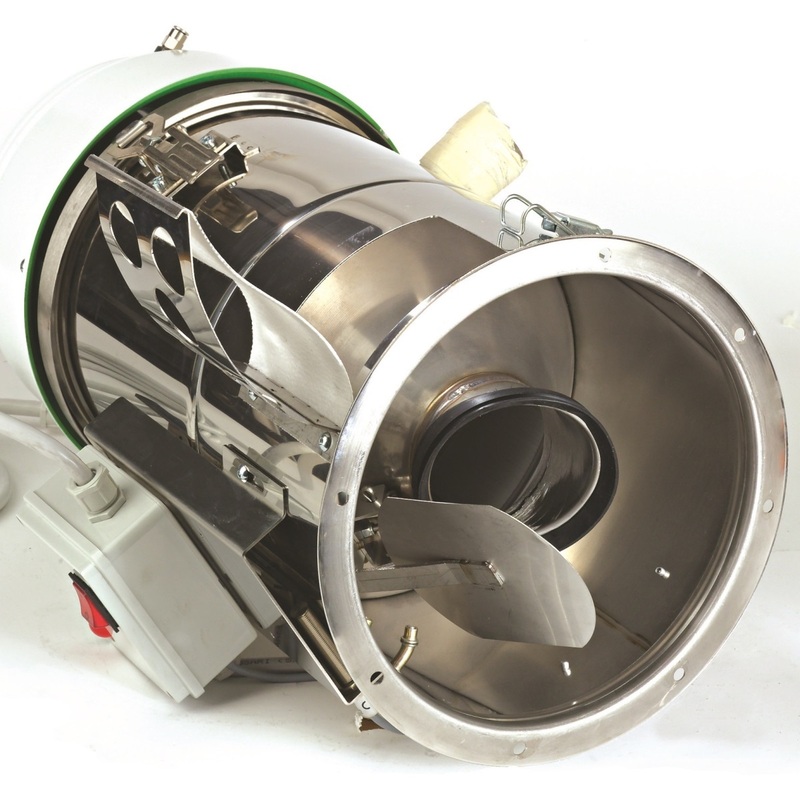 An inspection port with fabric filter for venting is mounted at discharge height. The hose and the suction probe are included. Remote control is available as an option.